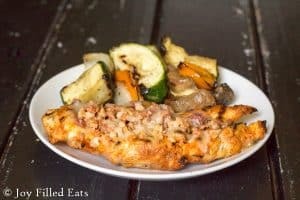 We have made my Cheesy Bacon Chicken so many times the last few months that I knew I needed to revamp this recipe to make it grilling friendly. 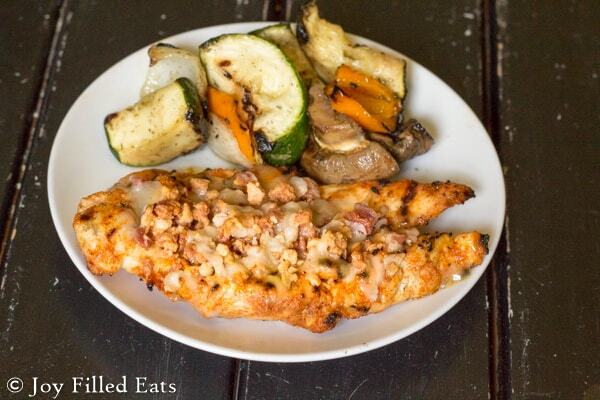 Grilled chicken is a summer staple in our house but it can get boring. Bacon and cheddar are never boring. I knew that covering the grilled chicken with my easy Smoked Paprika Rub, cheddar, and bacon would take it up a notch. At least thirty minutes before cooking put the chicken in a large bowl and toss with the seasoning rub. Refrigerate until ready to grill. Preheat grill. (This is optional but we like to spray the grill with grill cooking spray so the chicken doesn’t stick). Combine the shredded cheese and bacon crumbles in a bowl. Grill the chicken until cooked through and 160 degrees. We are big fans of meat thermometers. Move the chicken onto a metal pan (I use a disposable aluminum lasagna pans) and sprinkle the cheese oven the bacon. Put the pan back on the grill for about 5 min until the cheese is melted. Serve plain or with barbecue sauce. Preheat grill. (This is optional but we like to spray the grill with grill cooking spray so the chicken doesn't stick). Combine the shredded cheese and bacon crumbles in a bowl. Sounds great! I’m having trouble finding the nutritional stats on it. 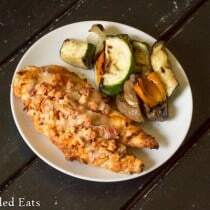 The cheesy bacon chicken looks good; however, the recipe didn't mention (that I noticed) whether the chicken had its skin and bones or not. I am guessing not, but am going boldly forth to try it with my chicken breast which has both. 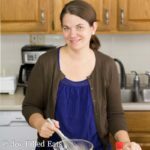 Glad to find your recipes! No, I use boneless skinless chicken for this. 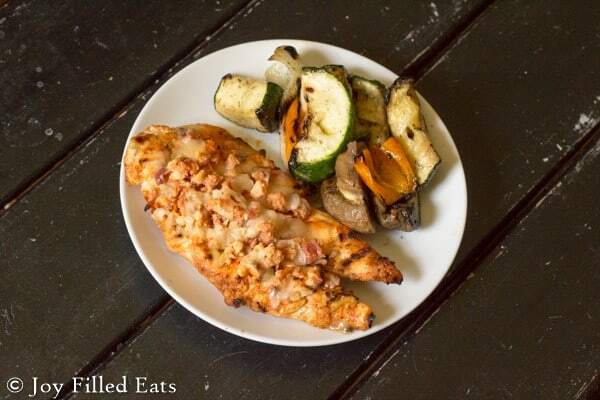 Bone in chicken would work but having the skin on under the bacon and cheese may cause the skin to be soggy. still can't find printable version . Hi Pat, if you are on mobile you need to click the green "read more" button for it to appear. Anxious to get the printable version. Thanks. Sorry, it's up now. We had to make an emergency trip to the doctor this afternoon. Looks yummy! Your post said to scroll down for a printable version, but I can't find a print button. Is there something I'm missing? No, you are right. Somehow my recipe plugin isn't there. I'll fix it later today when I get home. Sorry!